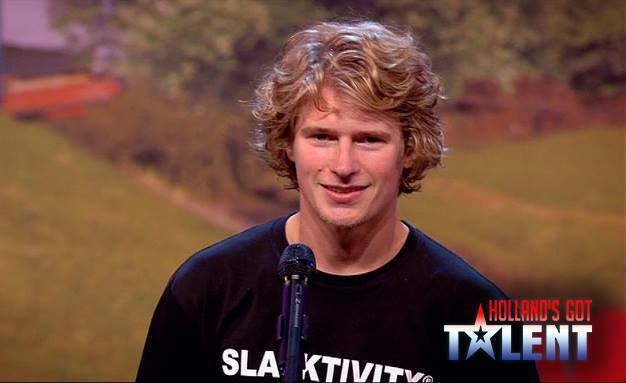 So, a couple of months ago my girlfriend encouraged me to participate in Holland’s got Talent. I wasn’t so motivated in the beginning, but it seemed like a nice challenge after some previous experiences with television and demonstrations. First, it was my plan to make a trickline show, as tricklining is much more spectacular for people who are not familiar with the difficulty of a highline. nnA couple of days before the recordings of the show the HGT staff called and informed me that they had a perfect highline possibility inside the theatre, above the audience and judges. A highline show is a bit of a risk when it comes to creating a successful show, but it was the ultimate challenge to see if my nerves would hold in front of an audience and 10 cameras!nnMy show was planned in the afternoon around dinner time. Tom Peek and Cor Vinke helped me with rigging the highline in the theatre. We only had 1 hour to rig and test the highline. On both sides we had to fix a rappel to get to the anchor points, which is difficult. It was super stressful to rig the line, because there was a super thin area where the slings had to fit through. After 50 minutes we managed to complete the setup. I leashed in and took some steps. In the middle I had to test with a big leash fall to check that it was at a safe height. I had some tries and began to enjoy the line. The location was perfect, an indoor theatre highline! I never thought this would be possible, a dream come true :)nnRight at the moment when I wanted to take a rest, the head chief of the show wanted a final rehearsal. I already was totally sweaty because of the spotlights that were all pointing at me. But it was a good idea to make a full test run. During the test run I found out that the startup should be a bit faster, I also found out on which spot I had to make my tricks to be perfectly positioned above the judges. People were waiting to get into the theatre, so we had a short rest and prepared for the real show. The show started with an introduction of myself and my act on stage. 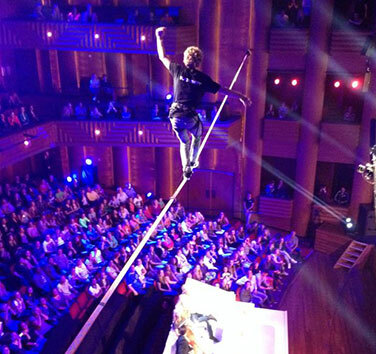 Judges were astonished about the idea that I was planning to walk over the slackline. I went up to the balcony, rapelled down and leashed in. The music started and my act had begun! Walking with the whole crowed and in front of a lot of cameras was challenging, falling was not an option because that would be the end of my act….. But I really liked the idea that everyone was watching me while I was having fun on a highline! So I stayed quite calm and made it easily to the spot were I planned to do static tricks. All my statics went pretty good and I heard that my two minutes of show were almost to an end. I rushed to go hanging on my toes above Gordon, one of the judges. The music stopped and I dropped myself from my toes into my leash. I heard some small screams from the audience and realised I brought my act to an good end!nnThe judges were a bit critical, as they couldn’t understand the difficulty of a highline, but they seemed to like me and so I made it to the next round!